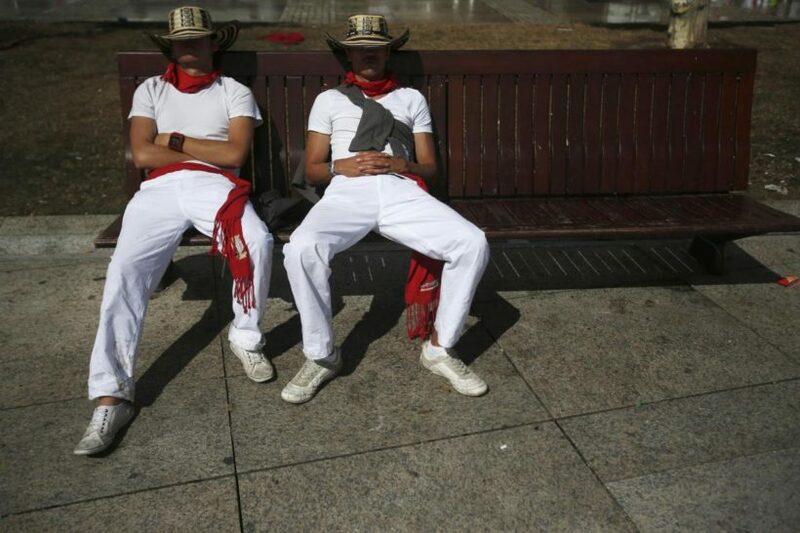 Revellers sleep on a bench after the second running of the bulls during the San Fermin festival in Pamplona. (NY Post) – Spain’s prime minister wants to shorten the working day — by saying adios to the siesta. A typical Spanish worker now checks in at about 10 a.m., takes a two-hour mid-afternoon snooze, and then clocks out around 8 p.m. But center-right Prime Minister Mariano Rajoy wants to get rid of nap-time, and make Spain more like its European counterparts. “I will find a consensus to make sure the working day ends at 6 p.m.,” declared Rajoy. The Spanish siesta has been in place for centuries, since before the Industrial Revolution when workers needed an hours-long break to take cover from the day’s hottest hours. Over the years, modern Spaniards across the political spectrum have pushed Madrid to align their workday with other European nations. Rajoy’s support is seen as an attempt to curry favor with voters ahead of the general election in June, the Independent reported. The move could have a widespread impact on all Spanish life. 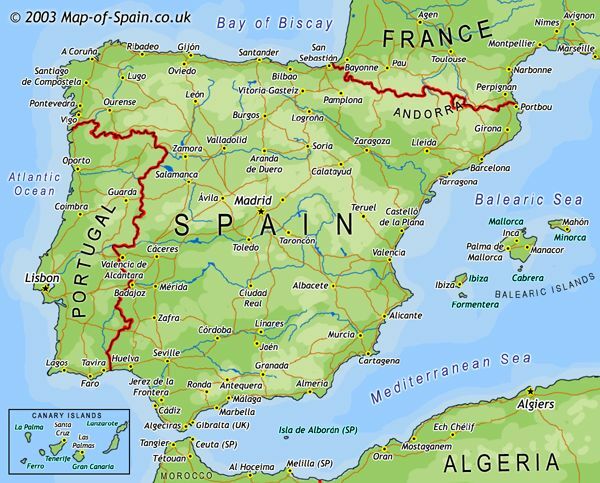 Prime-time television now runs from 10 p.m. to 2 a.m. in Spain. Midweek soccer matches, in Spain’s La Liga, typically kick off at 8:30 p.m.
Rajoy also wants to bring Spain back to Greenwich Mean Time (GMT). Even though Spain is directly south of England, it’s been an hour ahead of GMT for more than seven decades. The time change dates to 1942 when Generalissimo Francisco Franco ordered the nation’s clocks put forward in a symbol of unity with Nazi Germany. (Gulf News) Dubai: Drones are set to become the new inspectors, as Dubai Municipality has confirmed that it will use unmanned aerial vehicles to catch litterbugs red-handed. The municipality’s Waste Management Department has already purchased one drone as part of its trial phase, and according to officials, has so far yielded positive results. “Since they are very cost effective, we expect to have two more drones later this year, which will carry out inspections across deserts and beaches,” Abdul Majeed Al Saifaie, director of the Waste Management Department, told Gulf News on Monday. “We initially purchased the drone to monitor the landfill sites at Al Ghusais, Jebel Ali and Al Warsan, because as per regulations, they are allowed to reach up to 30 metres high,” he said. “In this way, we save money and time as the inspectors do not have to drive around and also, the drones can reach up to places that our employees cannot get to,” he said. However, the drones will not be restricted to monitoring dumpsites and development projects but are also set to inspect Dubai’s beaches and deserts against offenders guilty of leaving their rubbish behind. “As the good weather is expected to stay for at least another month, we expect a lot of people to camp in the desert until the end of April, and to also set up barbeques at beaches,” he said. Once the drones are up and running, Al Saifaie explained that they will monitor popular campsites, in addition to trucks that dump their waste illegally. “The main beneficial factor is the amount of time these drones can save. Instead of having municipality inspectors driving across the city, the drones will be able to fly directly to a number of different locations within a short time, and provide us with data and high-resolution photographs,” he said. The footage will then be used to fine litter bugs. It’s not been revealed what punishment people recorded dropping litter by the drones will face, but penalties for dropping litter on the beach are already strict. 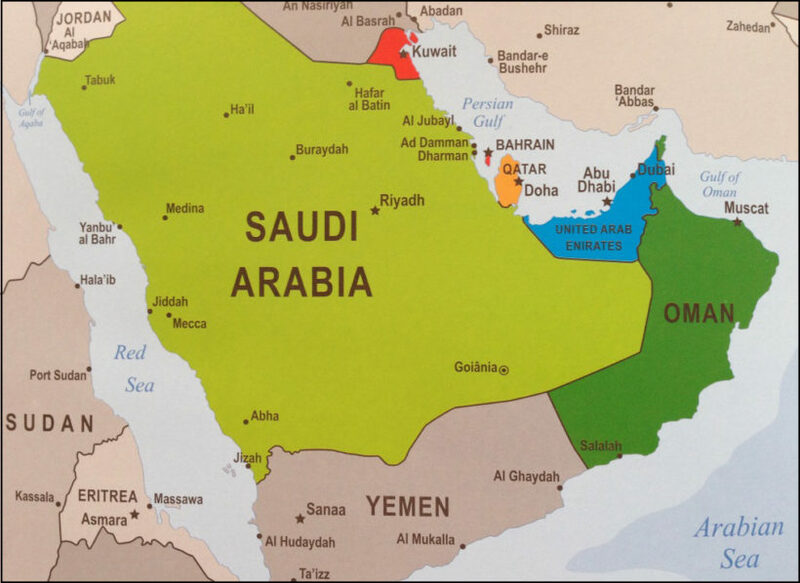 In June last year, the fines were increased, with a penalty of 1,000 dirham ($270; £190), The Khaleej Times reported. 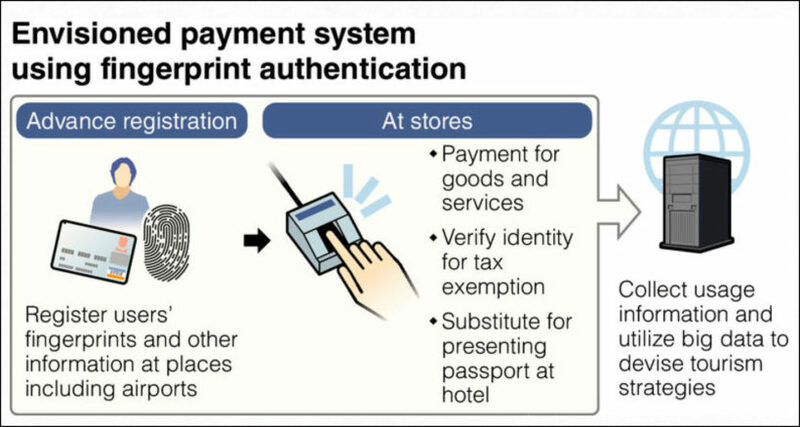 (The Yomiuri Shimbun [The Japan News]) — Starting this summer, the government will test a system in which foreign tourists will be able to verify their identities and buy things at stores using only their fingerprints. 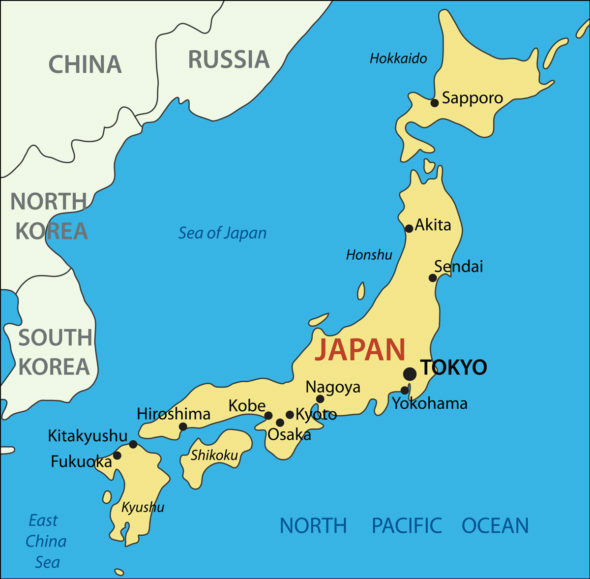 The Inns and Hotels Law requires foreign tourists to show their passports when they check into ryokan inns or hotels. The government plans to substitute fingerprint authentication for that requirement. A total of 300 souvenir shops, restaurants, hotels and other establishments will participate in the experiment. They are located in areas that are popular among foreign tourists such as Hakone, Kamakura, Yugawara in Kanagawa Prefecture, and Atami in Shizuoka Prefecture. The government plans to gradually expand the experiment by next spring, to cover areas including tourist sites in the Tohoku region and urban districts in Nagoya. It hopes to realize the system throughout the country, including Tokyo, by 2020. Introducing the system is part of the government’s efforts to increase the annual number of foreign tourists to 40 million by 2020. It is also aiming to demonstrate the country’s advanced technology by having tourists use the system when they visit Japan for the Tokyo Olympics and Paralympics. c) This report implies that Prime Minister Rajoy’s motive for eliminating the siesta is only self-serving – as a way to gain votes in the upcoming election. But others have been calling for the elimination of the siesta for a while. Regardless of the prime minister’s motive, a Spanish parliamentary commission said in a 2013 report that Spanish workers’ average productivity is much lower than in places such as Germany. Do you think this fact should affect the decision to eliminate the traditional siesta? Explain your answer. b) What is the benefit of using drones for these purposes? c) How will the municipality use the drone footage? d) Do you think U.S. towns, cities and/or states should begin a similar program? Why or why not? – consider the pros and cons. Explain your answer. b) What is the purpose of the fingerprint system? c) When does the government aim to have the system fully operational? d) How will the system work? e) Do you think we should have a nationwide fingerprint system in the U.S. similar to Japan’s? Why or why not – consider the pros and cons. Explain your answer. A siesta is a short nap taken in the early afternoon, often after the midday meal. Such a period of sleep is a common tradition in some countries, particularly those where the weather is warm. The siesta is historically common throughout the Mediterranean and Southern Europe. It is the traditional daytime sleep of Spain and, through Spanish influence, the Philippines, and many Hispanic American countries. The word siesta of the Spanish language derives originally from the Latin word hora sexta “sixth hour” (counting from dawn, hence “midday rest”). Siesta is also common in Italy (there called riposo, pisolino), where museums, churches and shops close during midday so that proprietors can go home for a long lunch and perhaps a snooze during the day’s hottest hours. Factors explaining the geographical distribution of the modern siesta are high temperatures and heavy intake of food at the midday meal. Combined, these two factors contribute to the feeling of post-lunch drowsiness. Rules for individual drone use in Dubai prohibit the use of drones at night, near buildings, people or near airports. Commercial drone use is still not allowed. Since April 2015, flying drones fitted with cameras in residential areas is a punishable offense as per the Federal Criminal Code. All drone activities shall take place within the visual line of sight of the user not above 400 feet from ground level (approximately the height of Dubai World Trade Centre) without the use of visual aids, such as binoculars and within the aircraft’s operational range. Fly only during daytime and in good weather conditions. Do not fly the drone within five kilometres from any airports, helipads, landing areas or manned aircraft. Do not fly near any buildings, houses, private properties or persons. Fly for fun and not for commercial purposes. Data concerning how and where foreign tourists use the fingerprint system will be managed by a consultative body led by the government, after the data is converted to anonymous big data. However, there are concerns that tourists will be uneasy about providing personal information such as fingerprints. The experiment will examine issues including how to protect one’s privacy and information management. Attempts to put similar systems into practical use are under way at a bank and a theme park in Japan. In October last year, the Huis Ten Bosch theme park in Sasebo, Nagasaki Prefecture, introduced on a trial basis a similar system in which visitors can make payments with just their fingerprints at about 30 stores and restaurants.